Japanese drummer and composer, Yuko Oshima started by playing drums with rock groups while attending university in Nagoya before moving more towards the genres of free rock, noise and improvised music. She has also had the opportunity to participate in collaborations with buto and contemporary dancers. In 2000, she moved to France and studied contemporary music and improvisation at the Conservatory of Music in Strasbourg. 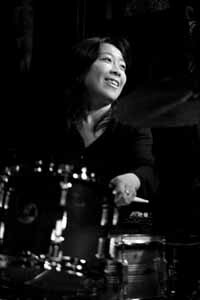 She currently plays with jazz/pop/rock ensembles, as well as standard jazz and French chanson groups. In her solo compositions, she combines electro-acoustic music for voice, samplers and other effects with more traditional drumming techniques. Having also participated in poetic and cinematographic music performances, she continues to experience an enlargening of her musical universe.